Today is a special day. It is the 67th anniversary of the founding of the People’s Republic of China. 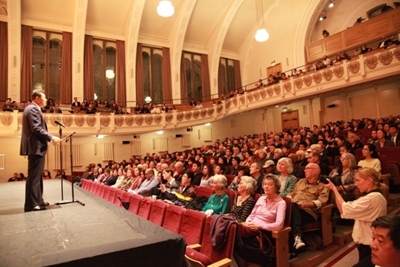 Today, friends from China and Britain gather together to enjoy a concert of classic Chinese choral music. The highlight of the concert is the Yellow River Cantata, which is a masterpiece that reflects the spirit of the Chinese nation and a milestone in the history of Chinese music. “You are the cradle of the Chinese people. These words capture vividly the spirit of the relationship between the Yellow River and the Chinese people. In past centuries, for many times the Yellow River broke through levees and devastated lives with massive flooding. The Chinese people have sought to harness this ‘wild beast’. For centuries, the Yellow River bore a witness to the perseverance of the Chinese nation against natural disasters and invasions. Many heroic tales have been recorded. “Stormy clouds veil the sky! Surging waves as high as mountains! Cold winds slap our faces! Today, after many a rising sun and setting moon, the Yellow River, in spite of its surging waves, has not flooded for decades. “Peace for Yellow River brings peace to the country”. This long-cherished aspiration of the Chinese people has now come true. The days of poverty and weakness have long gone. Today, the Chinese people are living in peace and the country is thriving in peace. Today, China is on its way to build a prosperous country and to realize the “Chinese Dream”. The great spirit that the Yellow River Cantata extols will continue to inspire the nation to move forward and to stay true to our mission. China and the UK were allies in the world anti-fascist war 70 years ago. We have fought together to safeguard peace and justice for humanity. Today, China and Britain are jointly building a “Golden Era” of global comprehensive strategic partnership for the 21st century. This partnership will serve to promote world peace and development. The Chopsticks Choral Society, together with singers from China and Britain, will soon start their performance. 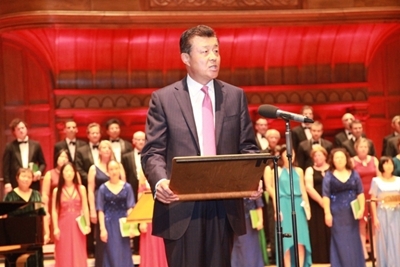 This is not just a performance but an ode to world peace and a call for China-UK cooperation. It is a call for us to work together to build the “Golden Era” of China-UK relations and make new contribution to world peace and prosperity. In conclusion, I wish tonight’s concert, a perfect match of the East and the West, a complete success!